As part of my ongoing winemaker interview series, I’m excited to share an update from Jamie Quai, winemaker from Quai du Vin Estate Winery in St. Thomas, Ontario. 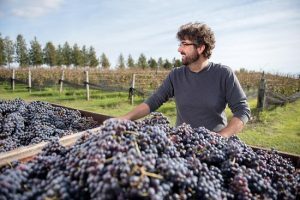 I interviewed Jamie for the blog in 2015 and since then he’s been crowned the 2016 Grape King by the Grape Growers of Ontario and continued to produce high-quality wine in an emerging region. 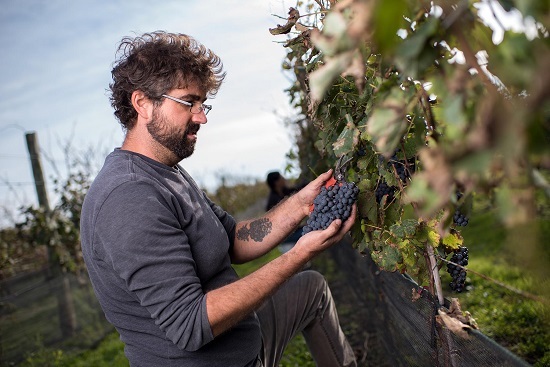 Wine making in Ontario is always challenging – what did you find most interesting about this year’s growing season? Photos provided by the winery. You have always been labeled as being part of an “emerging” wine region, but as wine tourism around Ontario grows, are you discovering any differences in terms of how many people are visiting and what they are saying about the region? Is wine tourism growing? I think experiential tourism is growing. And that’s fantastic. People are visiting a winery like ours as part of a getaway weekend, etc. Elgin County has done an incredible job showcasing all of the amazing food, beverage, arts and culture activities that we have to offer. Ten years ago people didn’t rave about their experience the way they do now. There may be more people visiting, they aren’t necessarily buying more, but they are buying smarter. It has been interesting to watch that evolution. People won’t necessarily buy the wine because they like it. They will buy more if they can imagine the wine as part of their lifestyle. It definitely means that as a producer that simply making good wine is not enough. People need to connect what you make to who they are. The experiential tourists still think of Elgin County as underrated, and we all like to feel that we discovered something special. Regions like Prince Edward County are seeing issues with volume – some have had to close their doors because they are simply running out of product. Is that something that concerns you as the region becomes more popular? Not at all – ha ha! We’ve been around for three decades. One of the little bits of wisdom that new producers can be told, but generally don’t fully grasp, is that you always have to over produce. Here’s what I mean: lets say you want to make 1,000 cases of wine a year, well in Ontario the climate, vineyards, terroir, whatever, are going to give you five years out of 10 that are below average (math! ), so you have to make up the difference in the remaining five years. In good years you have to produce 30-40% more. 1,300-1,400 cases is the new target. Then there is cellaring time, premium wines generally need long aging times before release. So you may be harvesting vintage three while vintage one is just about to hit the shelves. If vintage one is a huge success, you can’t factor that into your growth plan until year seven (year four you realize, year five you plant, year seven you get grapes, year 10 those wines are available). So now you have the better part of a decade you are buying outside fruit or wine to maintain the momentum. And bringing in “extra” is addictively easy. To make a successful 1,000 case wine you have to produce almost 1,600 cases as a target. I have always tried to produce in excess of my in store sales. In excess years, you push liquor store, grocery sales. In lean years, you throttle that back. We do the same thing with bulk wine we sell to other wineries. I may sell as much as 20% of my production to other wineries to bottle. But I have built in that potential. I’m already thinking about new onsite plantings to grow some of our wines, in anticipation of demand in the middle of the next decade. How important is it to you to use grapes exclusively grown in your region? Why or why not? This is the most critical issue we face right now. A newer region, when it forms, puts a lot of energy in to creating awareness. Once the word starts to get out, the players in the business have a very narrow window define themselves in the eyes of their consumers. We were the only winery in our area for a very long time. Wisdom says that when a new player comes into the scene, there will be growing pains and they will have to lean on brought in fruit (we did). But if you’re the winery that is regularly dependent on growers from outside of your region when the excitement of being the new winery fades, then you’re just a farm team for a more successful region. When the new players started to evolve in our area we doubled down on our commitment to buy almost nothing from outside of our farm, let alone outside of our region. That strategy has paid off. We can now define ourselves as producers who grow almost exclusively all of their own fruit. That’s huge to wine lovers! You have one of the best winery tours in the region (perhaps anywhere) and I believe that is because you are not only a winemaker, but also an instructor in wine making – what is important to you about making the tour experience so informative? Thanks! An important part of the tour experience for me is to connect with our guests. Tour times are an unfiltered window in the minds, tastes, and experiences of someone who like wine. I have become a business owner who gets two-three 90-minute focus groups a week in feedback! Tours always start the same way – I tell the guests that any questions about anything wine (even if its not about us) are fair game. I give thoughtful answers and if I cant answer hopefully I can give direction. People want to learn, and when they realize its not a show, and they have my undivided attention, the tours really come alive. Sometimes we talk about the business, sometimes we talk government, sometimes we talk chemistry and sometimes we just talk food and wine. It is also important on tours that guests understand I’m trying to walk a fine line. I don’t want to talk down or be a snob about wine, while at the same time trying desperately to not dumb wine down – “I’m not trying to turn wine into soda pop”. I don’t want to demystify it, but to share the passion and inspire guests to explore. Are there any misconceptions people have about the wines in your region that you would like to clear up? I’m not 100% sure, but that’s a great question. I’m going to flip the question a little and talk about some of the misconceptions we may have as an emerging region and where we are in our evolution. I feel like one of the biggest misconceptions about our area is that we have a solid grasp on what our area is. So relatively little of what is produced here has been 100% from this region, that we really don’t have that firm experience with who we are. We are still in the early stages of discovering ourselves. This is a collection of eager and passionate producers trying to grapple with a huge set of unknowns. Those questions take time to answer. I’m 36 and working with some vineyards planted in my teens, which I’m still not convinced have hit their pinnacle of quality. I’ve been fortunate enough to try a lot of wines from our area and there is potential for greatness. But greatness is an aspirational goal. The wines I’m drinking from our region are enjoyable, well made, approachable, and delicious. Greatness comes with experience, wisdom, and time. The vines will mature, the track record will grow, and from all of that hard work greatness may appear. The biggest misconception may be that we are not an emerging region, but are firmly established. If the leaps and bounds in quality I’ve experienced so far are any indication – I hope we are emerging for decades to come! A huge thanks to Jamie for sharing his thoughts for this post. You can learn more about Quai Du Vin Winery on their website. I highly recommend a visit if you’re in the area.